Bloat and gastric torsion is a serious condition and your pet should be rushed to the emergency room if this occurs. Certain breeds of dogs with deep chests and narrow waists, such as hounds, bouvier des Flandres, or doberman pinschers are more susceptible to a syndrome of gastric torsion and bloat. This occurs when the stomach twists on its supporting ligaments and the contents begin to release gas pressure. A similar disease is seen in cattle and horses as well. 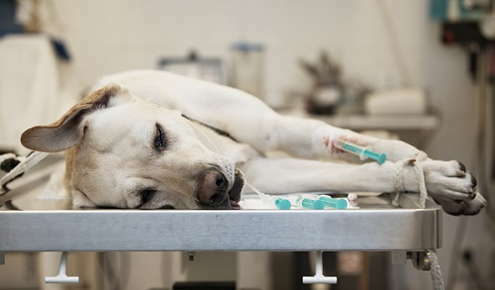 Dogs who experience such an attack are very susceptible to another which is usually more severe, and this is one case where immediate veterinary care is needed, normally requiring abdominal surgery to prevent a recurrence.